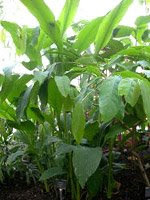 The root of this plant is the main ingredient for curry and is also used as a dye for clothes and food coloring. Before the root can be used, it is boiled, dried and then grinded. Tumeric contains curcumin. This is said to have an anti-inflammatory effect on Rheumatoid Arthritis and Arthritis related diseases. Tumeric has more benefits though. It contains high levels of iron and manganese and vitamin B6 and potassium in moderate levels. 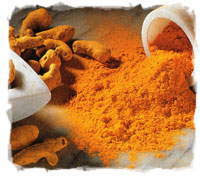 Origin:A yellow-colored powder ground from the roots of the lily-like turmeric plant. It is a common ingredient in curry powder. The turmeric plant grows in India and Indonesia and is related to the ginger family. Capsules or spice. Capsule, typically 400 mg to 600 mg three times per day; or 0.5 g to 1 g of powdered root up to 3 g per day. Reduces pain, inflammation and stiffness related to RA and OA; treats bursitis. Known as a cleansing agent, tumeric often is used as a digestive aid in India. Traditionally used in Chinese and Indian Ayurvedic medicine to treat arthritis; the active ingredient in turmeric is curcumin, which is nontoxic. Several recent studies show that curcumin or turmeric has anti-inflammatory properties and modifies immune system responses. A 2006 study showed turmeric was more effective at preventing joint inflammation than reducing joint inflammation. High doses of turmeric can act as a blood thinner and cause stomach upset. Do not take if you have gallstones or are taking blood-thinning medications. Some other qualities are contributed to Tumeric. It also seems to be beneficial for conditions like Irritable Bowel Syndrome, Arthritis Cancer Prevention, Cancer Growth Restriction, Alzheimer's disease and Cystic Fibrosis. Other qualities are that it also prevents heart disease and lowers cholesterol levels. Studies of the effects on several of the conditions above are in progress, but no concrete proof has been found yet. Tumeric can be purchased as a tea or in pill form. The last is helpful, when used for supplement purposes only. More commonly is the well-known powder form, which can be, and is used, in recipes. Many recipes can be found on the Internet. So, if you like to cook with it, just do a search. You will not be disappointed or come up empty handed.